Things have really started to pick up with my husband's work over the last several months. The increase has been great news for their small, family business- especially when just a few short years ago, they were struggling to keep the doors open when the economy bottomed out. Which, lucky us, happened about four months after he and I bought a house and got married. Fun times, y'all . So, while we are very grateful for the recent upswing at "the shop" as it's called, B has been working his tail off nights and most weekends to keep up with everything making it a little difficult for the two of us to have any decent QT together. We've been trying to spend at least one full day together, usually Sunday, either being lazy [because the man deserves some day-long Hannibal marathoning and pizza binging] or doing something fun away from the couch, as you might've seen me post about on Twitter and Instagram with the hashtag #Sundate. 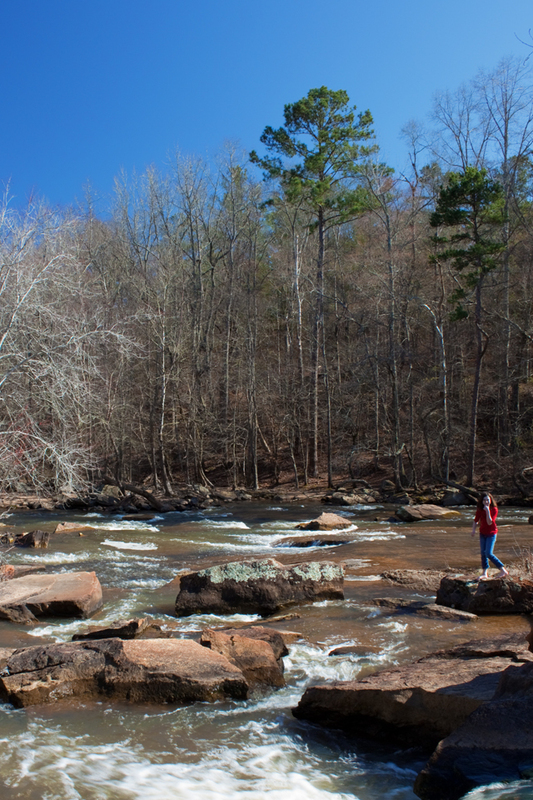 This past weekend, B decided to take the FULL weekend off and once we saw Saturday's forecast predicting sun, warm temps, and not a drop of rain, we decided to check out nearby Watson Mill Bridge State Park. I'm a big history nerd as it is (growing up in the oldest city in the US will do that to you! ), but now that I live in Georgia I've developed a bit of a crush on old, covered bridges. I don't remember ever seeing them in real life until I moved to Georgia almost a decade (omg) ago, so they were always one of those things you saw on TV and in old movies but never realized they actually existed. And, as I've come to learn, are still used! Frequently! There are 15-20 (depending on who you ask) historic covered bridges still in existence in Georgia, mostly clustered between middle and north Georgia- and now that I've visited two of them (there's one just a few miles from our house! ), I'm anxious to see the rest! Watson Mill Bridge is the longest covered bridge in Georgia. Built in 1885 by Washington (W.W.) King, the bridge spans 229 feet across the South Fork of the Broad River. King was the son of Horace King, a freed slave and famous architect who designed and built many bridges across the Deep South in Georgia, Alabama, and Mississippi in the 19th century. 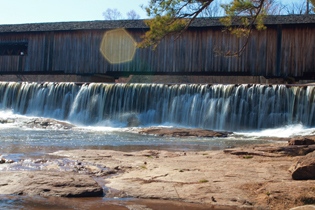 The bridge, supported by a town lattice truss system held together by wooden pins, served local traffic, workers of the grist mill and saw mill (no longer in existence), and was even a common site for picnics and square dances. In 1973, the bridge was restored by the Georgia Department of Transportation (GDOT) and was reopened as the center of the newly established state park that surrounds it. Watson Mill Bridge State Park is just a short drive from our house (under an hour) and I honestly cannot believe we've waited this long to visit! There are plenty of places to explore including the covered bridge, several miles of hiking, biking, and horse trails, camping sites, and so forth. We easily spent several hours at the park just nosing around and enjoying the perfect weather. 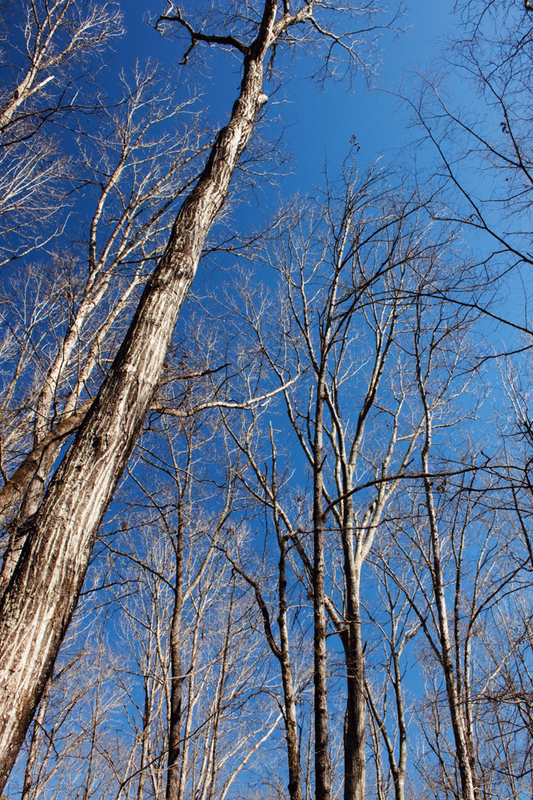 After so many weeks of winter dreary-ness, it was almost shocking to see such bright blue and cloudless skies! I can't wait to come back once everything is green again- I think we've found a new favorite spot to bring out-of-state visitors. Of course, like the true country-boy he is, B just couldn't resist kicking off his shoes and wading out onto the slippery shoals! 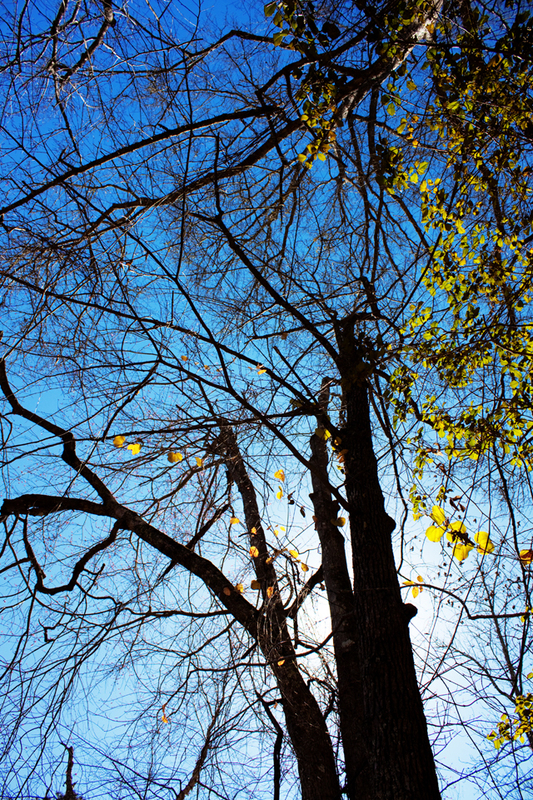 I have this weird thing about taking photos of the tree canopy above me when we go hiking... even when there is no actual canopy. I guess because I'm short, looking up is a default, ha! As you can see below, I realized about halfway into our visit that there seems to be some dust or something inside my camera lens. I took over 100 photos and most of them were ruined by these giant dust orbs. I considered sending the lens off to be cleaned, but since it's just an inexpensive one I've had for several years, I'm not sure it's even worth the trouble. My birthday is in a few short weeks so maybe I'll just replace it with one that's been on my wishlist for a while... but of course, while doing some lens researching I thought, "why replace just a lens when I could upgrade my WHOLE KIT!?!?!" It's a slippery slope, folks. And I need a winning lottery ticket, ha! Dreamers gonna dream. If you're in, near, or planning on visiting Georgia and want to visit Watson Mill Bridge State Park or any of the other covered bridges in the area here are a few great resources- Enjoy!